Congratulations to the Dominica Labour Party! The DLP may soon be the first political party in Dominica to own prime real estate in the city of Roseau. Multi-sources have confirmed to The Sun that the ruling DLP is the owner of a building on King George V Street known as Lot 62 containing 4,703.8 square feet and formerly owned by the late Karol Winski and Sir Andrel Laville, also deceased. 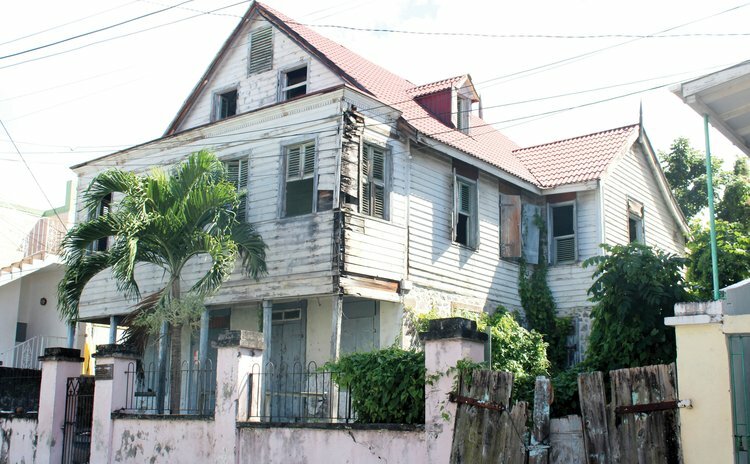 A SUN investigation has revealed that the property has been up for sale for about five years, since July 2012. A valuation of the property by Eric P. James, managing director of QSC Ltd, estimated the market value of the property at EC$1,737,800 which included a residual value of EC$91,500 for the building. The building is a two-storey structure with an attic and an overall floor area of 3,161 square feet. The main floor (ground floor) is divided into four spaces while the first floor is made up of five spaces plus bathroom area. The attic is open. Joshua Francis, the attorney-at-law who initially represented Laville confirmed that the property has been sold but he was not the lawyer completing the transaction. "I can confirm to you that the property has been sold but I have no details," Francis said. Duncan Stowe, another lawyer, also confirmed that he was involved in the transaction. However, he refused to provide details claiming that he was bound by the principle of "lawyer client relationships". Stowe, however, confirmed that the DLP had in fact purchased the property but again stated that, "this is a lawyer-client relationship and that (aspects of the transactions) was not for the public." The Sun was told that a real estate firm owned by Curtis "Joey" Lloyd was responsible for the sale of the property. It was sold at EC$1.2 million. However, Lloyd is now seeking his commission which had not been paid and he has since slapped a caveat on the title. Two other persons with information on the DLP purchase of the property confirmed the transaction. "The DLP has paid for the property but they cannot get the title since a caveat has been slapped on it," one source said. A reporter from the SUN contacted Petter St. Jean, the DLP president about the ownership of the building. St. Jean did not confirm nor deny that the DLP had purchased the building but instead directed the reporter to party leader and Prime Minister Roosevelt Skerrit. "Speak to the leader of the party on this matter," St. Jean said. When the Sun called PM Skerrit, at his residence, a female who answered the phone, asked the reporter to "hold" and later told the reporter that Mr. Skerrit "will return your call." Additional calls to Mr. Skerrit's number were not answered and up to press-time the prime minister had not returned the call.